Ocka and his teammate Barry Kanga O’Connor were keen freshwater fisherman, concentrating on the lakes around North West Victoria and a nearby pub. Ocka has a unique ability to train worms to place themselves on a hook and then remove themselves just as quick once in the water. He was on the Committee and Social Secretary in the 70’s and was one of the Main Members of the Football club Reviews, his rendition of Adolfus Twerp in the Ron Blasket and Gerry Gee act was hilarious. A wonderful Clubman, family man and all round great bloke. So pleasing his nephews Seamus and Liam Whelan are proudly representing the Purples today. Playing Career: 1973 – 1980. Never threatened to reach the dizzy heights beyond “the brekkies” (Played 105 games for the Club including two senior games). Major Injuries: Ankle-tapped by Les Murray once. I reckon he was worried I might take over his half forward flank, goal sneak position in the ones. He needn’t have bothered. 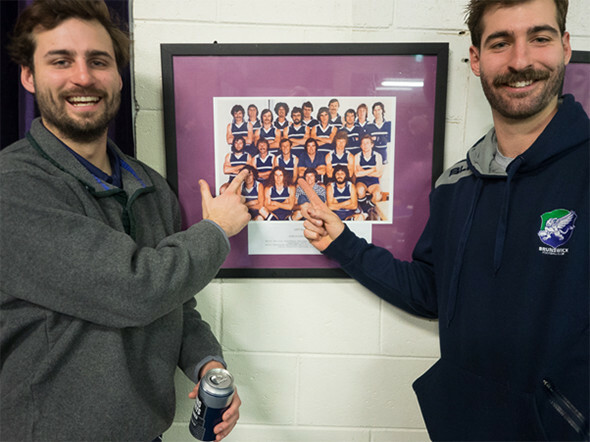 Playing career achievements: Kicked 3 goals against Ivanhoe once… and lived to tell the tale. NOBS was a family club, where you could get a kick, have a beer and have a real good time. Ask the old timers about the club reviews of the mid/late 70’s. In those days we had no club rooms at Brens Oval so we were allowed to have our after- game drinks at the college hall in Queensbury Street. Several of the player’s mums and wives served pies and a cuppa from a tent alongside the ground. Left-over kegs could be sampled at Brens after Sunday morning training from the back of the trailer. A bloke called Harry Leigh used to run the boundary and I reckon he must have umpired thousands of games. The Guernseys were made of wool and were itchy, but such a great colour (purple and white). At the time our social occasions were often held at John and Ursula Nelson’s place in Oak Park. Their neighbours must have been VERY forgiving. Footy trips, if I remember rightly, were usually in a bus and we went to a country pub near the NSW border (Yarrawonga, Cobram??). Fortunately, there were no mobile phones with cameras in them but Fog or Broph might still have some embarrassing photos for sale at the right price. Best player seen on the field at Brunswick/NOBS: From a long list, Mark Hanneberry. Best player seen off the field at Brunswick/NOBS: Patrick Fennelly, by the length of the straight. Professional career and current location: Had a few jobs after leaving Victoria in 1981, mostly in the Iron Ore industry, but retired as a sparky a few years ago and I now live in Roelands, south west WA. Current Brunswick NOBs Seamus (L) & Liam Whelan (R) point out their Uncle Mick “Ocka” McCormack.